Why are they called “shrine sales”? Because they’re held on the grounds of temples and shrines, of course. 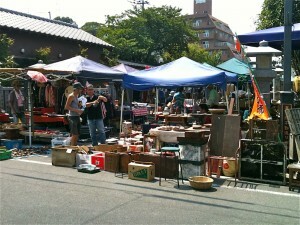 But they go by many names: Antique market, flea market and “nomi no ichi” (flea market in Japanese). Whatever you call them, they’re always fun and interesting. Dealers sell beautiful old kimono for as little as ¥500, obi, tea boxes, antique ceramics and artwork, among many other treasures. Vendors are usually open to bargaining and may reduce prices 20% or so. Indoor markets tend to have finer goods and higher prices, but of course they take place rain or shine. Outdoor markets are often canceled for heavy rain. 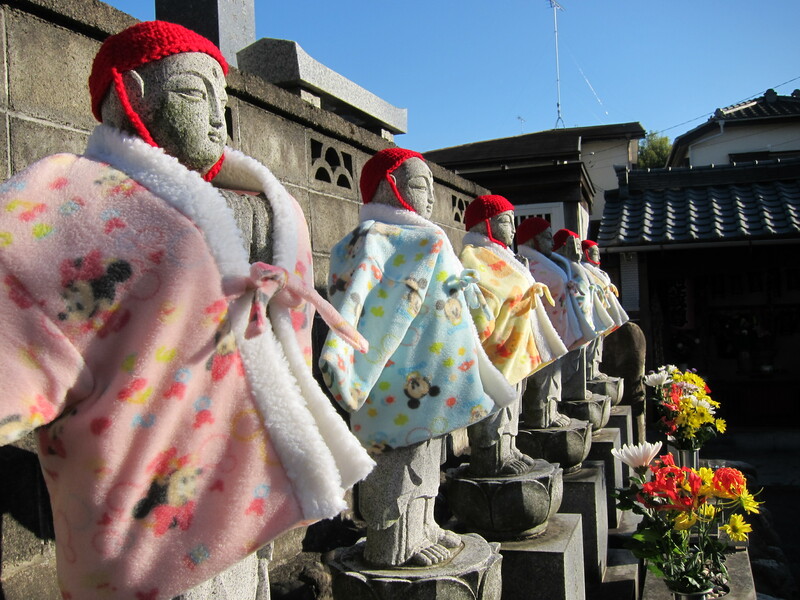 One of the most interesting and inexpensive shrine sales around here is at Kumagawa Shrine, a seven minute drive from Yokota, on the second Sunday of the month. Mr. Akira Sunagawa is the coordinator of this shrine sale. Sunagawa-san owns Marii antique shop outside the Supply Gate on Route 16. He speaks fluent English and will be happy to help you with any questions. About 30 vendors set up here. Wooden tubs, baskets, hibachis, toys, dolls, blue and white china, obis, teapots and swords are all for sale here. It’s also called the Shichifukujin Antique Market, for the Seven Deities of Good Fortune you can see inside the shrine compound. DIRECTIONS: Go straight out Fussa gate. Cross over two sets of railroad tracks and go through four signal lights. The fourth signal light will be at Shin Okutama Kaido. (The Fussa Post Office is on your right across the street.) Turn left at this traffic light. Drive straight on Shin Okutama Kaido and you will eventually cross another set of train tracks. Continue straight until you see a Big Boy restaurant on your right. Turn right immediately after Big Boy and head down the narrow road. The road will then ‘Y’. Take the right fork and continue straight in with the back of the Big Boy parking lot on your right. You will soon see the shrine’s torii gate. There is limited parking on the left in a gravel parking lot in front of the torii gate. If this parking lot is full, continue along the road to the back of the shrine, turn left and there is another parking lot behind the shrine. Mavis Hara. Directions updated 2011. Kawagoe is filled with treasures. It is held on the 28th of every month from dawn to dusk, rain or shine. It’s about 1 to 1.5 hours drive from Yokota. Or you can take a train from Higashi Fussa Station. DIRECTIONS: Set the odometer at “0” as you turn right out the Terminal Gate, turning north via the underpass onto Route 16 where you will stay most of your trip. At 10.9km, the road splits with Rt. 16 to the left. The road also narrows to two lanes temporarily. Follow the blue signs for Kawagoe and stay on Rt. 16 as it bears left again. You will pass the SATY store on your right at 15.2km. Route 16 turns right around a bend at 23.4km with more blue signs to direct you. At 26.6km (round Hotel 10 ahead), bear left onto Rt. 254 toward Higashi Matsuyama. Stay in the left lane, go under the arched pedestrian bridge at 27.1km, then make a left turn immediately afterward (not before the bridge). At the second light, 27.9km, make a left then park in the lot on your right (¥500/three hours) before the Kitain Temple complex. The monthly sale is held at Narita-san Shrine, a couple blocks to the right down the street on the other side of the parking lot. GPS for parking lot: 35.9186,139.4902. About a kilometer away from the shrine sale is “Old Kawagoe,” also known as “Little Edo.” Refer to the Sightseeing section for more detail. Barbara Kirkwood, 2001. Directions and lot details verified 2010. This shrine sale near Tachikawa is on the grounds of a beautiful temple. About 120 dealers show up. Third Sunday of each month, 7am-4pm. (See Tachikawa Sights for more info about this temple.) GPS for parking lot entrance: 35.66164,139.41131. DIRECTIONS: Set your odometer to zero and turn right out the East Gate. At the first signal light, turn left. At the next light (0.6km), a five-way intersection, make a hard right turn. At 5.2km turn left at an intersection with a Daihatsu/Onyx car lot on the far left. This is a large four-lane street (Shin-Okutama Kaido, Route 29). At about 9km, you will see a VW dealership on the left and arrive at Tachikawa Five Corners. Turn right here onto 256 and cross the Tama River. Drive along until you reach the street that has the elevated monorail down the middle. Turn left and follow the monorail line past Takahata Fudo station. Cross under a set of railroad tracks and at the next intersection, signposted “Takahata,” turn right at the light. Takahata Fudo will be on your left, about 3 blocks after the light. Turn left into a small parking lot. Please note this is a popular temple and parking is scarce. DIRECTIONS BY TRAIN: Take the train from Fussa to Tachikawa. Exit the station and follow the signs for the Tama monorail station. Ride it until the Takahata Fudo stop. The temple is a two-minute walk from there: Exit the station by the main entrance and look to the right for a red tori gate. Walk through the gate and along the shopping street. It ends at the temple. One of the very best flea markets is held on the first Sunday of every month, at Arai Yakushi Temple in Nakano. Over 80 vendors offer items ranging from grandfather clocks, musical instruments, porcelain dishes, old kimonos, etc. What- ever you are looking for, you will probably find it at Arai Yakushi. DIRECTIONS: Take the Ome Line Fussa Station to Tachikawa. Change to the Chuo Line. Get off at Nakano Station and take the north exit next to a large indoor shopping mall. In front of the mall runs the Nakano Dori street. Follow the street for about a 15 minute walk to a five-way intersection. Take the first right after the intersection. The temple will be a short distance to your left. Alternatively, take the Seibu Line from Seibu Tachikawa Station toward Taka-danobaba – but you will get off at Arai Yakushi Station. Leave the station, turn left and walk three blocks. The shrine will be on your right. The Roppongi Roi Building (near the Hard Rock Cafe and Spago’s) houses a flea market on the fourth Thursday and Friday of each month. There are over 30 dealers, and the prices are said to be good. DIRECTIONS: From Fussa station, take the Ome Line to Tachikawa. Change to the Chuo train to Shinjuku. Transfer to the Yamanote Line to Ebisu. There, change to the Hibiya Line and go two stops to Roppongi. Exit the ticket wicket and turn right. Go upstairs and turn left. On the corner across the street, you will see the Almond Cafe (large pink sign). Cross the street to the cafe, turn right at the corner and go one and one-half blocks. On the next big corner will be the Roi Building. For more information call the Kottoichi Co. at 03-3980- 8228. One of the most well-known antique fairs is the Tokyo Antique Fair held in the Tokyo Ryutau Center in Heiwajima. It is a big one, with more than 250 dealers. The three-day event held four times each year. Dealers bring everything imaginable including furniture, lacquer ware, ceramics, and baskets. There are dolls of all kinds including kokeshi, hakata and cloth. There are kimonos, obis and fabric for tablecloths and other sewing projects. You will find jewelry, tea ceremony sets, teapots, and spinning wheels. There are old postcards and pictures, coins, stamps, and collectibles. It is an indoor market, therefore the dealers charge more to recoup their cost of rental space. Bargaining with the dealers is expected and encouraged. One advantage of this large market is that the dealers will deliver large purchases or make arrangements to have them delivered for you, for a fee of course. The fair is located in the exhibition hall of the Ryutsu Center on the second floor. You will find clean rest rooms and restaurants on the second floor as well. The restaurants are reasonably priced but remain crowded. The fair is open 10am- 6pm Friday and Saturday and 10am-5pm on Sunday. Admission to the fair is free, but parking is costly. The fair is held in March, June, September and December, usually the second weekend. Check on the dates before venturing out. Information can be obtained by calling the English information line in Tokyo, 03-3980-8228. The Yujo Community Center usually has access to this information as well. DIRECTIONS BY CAR:Take the Chuo towards Tokyo (Shinjuku). It will join the Shuto Expressway. Follow the through-traffic signs and the signs to Route 1. You will go through three tunnels. As you go through the third, the Chiyoda Tunnel, take the right branch at the first split. From there keep to the left until you exit the tunnel. After you pass the Kasu-migaseki exit (Exit 24), the road will split. Follow the signs to Haneda Airport, or Routes 1 and 2. You will be able to see Tokyo Tower ahead on the left. When the road splits again, follow the signs to Haneda, Routes 1, 6 and 7. When the road splits next, follow the signs to Haneda, Route 1, to the right. You will now be heading to- wards Yokohama. Tokyo Bay and the Monorail will be on the left. Continue to follow the through traffic signs on Route 1. After you pass the horse racing track on your left, at about 9 kilometers, you will exit to Heiwajima (Exit 105). You will be on the frontage road; go straight and keep to the left lane. You will need to take the first left after the traffic light. Take the first left, which will bring you past a guard booth and you will be on a wide street. There will be a six- story, open-sided building on both sides of the street. You will need to keep to the left lane. Just ahead of you will be the Ryutsu Exhibition Hall (two-story, white building). When the street ends you must turn left. You will see the entrance to the parking garage on the right. Take a ticket from the machine as you enter and be sure to remember where you parked. From the parking garage you can enter the hall from the ground level and go up to the second floor or you can use the walkway from the garage on floor M34. DIRECTIONS BY TRAIN: Take the Ome Line to Tachikawa. Change to the Chuo Line to Shinjuku. Change to the Yamanote Line and get off at Hamamatsucho Station. Here switch to the Tokyo Monorail Line heading to Haneda Airport. Get off at Ryutausenta Station, the second stop from Hamamatsucho. The exhibition hall will be ahead of you to the left when you exit the station. An alternate route is to take the Seibu Haijima line from Haijima or Seibu Tachikawa Station. Get off the train at Takadanobaba Station and change to the Yamanote Line to Hamamatsucho Station. As the new year comes, the Japanese undertake an early “Spring Cleaning” to end the old year and begin anew. It is one of the best times for hitting the markets and junk shops. One well-known open air market is Boro Ichi in Setagaya during December and January. It is named Boro Ichi or rag market, because in past centuries, some stalls sold rags and straw used to make sandals (waraji). You can pick up a pair of waraji to keep as a souvenir. This market, originally called Raku-ichi, began over four hundred years ago. The selection is large, and includes not only antiques but also new year’s decorations, hagoita (colorful battledores), daruma dolls, and potted plants. Unfortunately, the crowds become overwhelming later in the day. Arriving while the vendors are still setting up around 8am is best. By noon, there are people from all over and it may be impossible to move around. The dates are always the same, December 15 and 16 and January 15 and 16. If you really like antiques, go both months. The selection won’t be the same. Boro Ichi stalls will be set up on Daikan Yashikimae-dori, Kamimachi, Setagaya-ku. DIRECTIONS: Take the Ome Line toward Tokyo. At Tachikawa, change to the Nambu Line on track eight. At Bubaigawara change to the Keio Line for Fuchu/Shinjuku. You can take an express or regular train, but if you take an express, get off at Chofu and transfer to the local (across the platform when the express pulls in) and get off at ShimoTakaido. Transfer to the Setagaya Line (a very small line, only two cars) and take it to Kamimachi Station. At the station, ask for directions to Daikan Yashikimae- dori (the street where Boro Ichi is located) or try walking to the end of the platform, turning right, crossing the tracks and going two blocks. 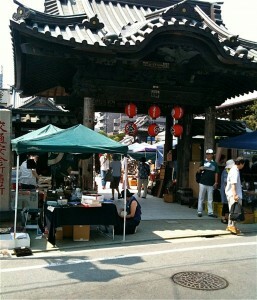 A market similar but smaller is the Boro Ichi at Honryuji Temple in Sekimachi, Nerima-ku, Tokyo. This market is held December 9 and 10 from morning until l0pm. Honryuji Temple is near Musashi-Seki Station on the Seibu Shinjuku Line. 250 vendors. Courtyard of the Tokyo International Forum, 3-5-1 Marunouchi, Chiyoda-ku, Tokyo. 1 min. walk from Yurakucho Station (JR) or 5 min. from Tokyo Station. Also Yurakucho metro station. Every Sunday (But spotty in May and November)6am-3pm. Three consecutive days, four times a year. 40 dealers, Dai-ichi Seimei Bldg. Third Saturday of each month, 6am-4pm. This entry was posted in Shopping, Shrine Sales, Top 5 Shopping and tagged Shopping. Bookmark the permalink. Togo Shrine sale is most certainly closed as is the sale at Nogi Shrine in Akasaka. Thank you! IF anyone has updates on other shrine sales, please let us know.